A friend gave us these muffins a while back and I took the photo before we polished them off because I knew I wanted to share the recipe. She gave me the cookbook last week and now I’ve finally managed to get the recipe typed up for Chocolate Chip Zucchini Bread. The combination of chocolate and zucchini might seem a little unusual but it actually works really well. The cinnamon really seems to bring it all together. This recipe is from Cooking Light so unlike a lot of the recipes I’ve been posting lately, they can be enjoyed with a little less guilt! 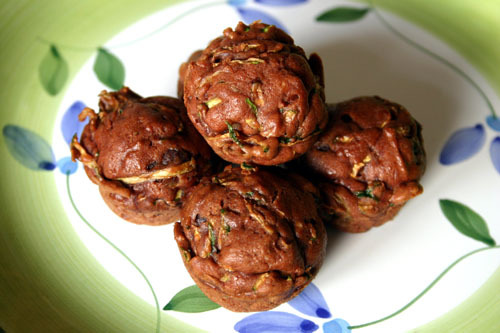 The recipe below uses a loaf pan but it worked well with a mini muffin pan too. Just make sure that you really cut the baking time if you decide to do muffins. 2. Place first 3 ingredients in a large bowl; beat with a mixer at low speed until well blended. Stir in applesauce. They look great... Don't sound as good! But my wife made something similar, and it actually does work pretty well. I'm about to fix some breakfast, so I'm edging toward her banana bread now!I was looking at your old bread blogs... I'm about to start making artisanal breads, and those pics have me motivated, thanks! Let me know your progress on the artisanal breads. I'm still struggling with many types of bread but I've really been enjoying the learning process (except for when the glass exploded on my oven door while I was was trying to add steam...be careful!). I hope my oven doesn't have that problem... One reason we looked at the house we're in was that it was already equipped with a professional series Dacor dual fuel range! :)I'm also thinking of buying an outdoor oven that's either charcoal or gas powered to do breads in it instead of inside, especially in the summer. I thought this looked familar. Haven't tried it yet, but I will. I like the combination, have it in a cake recipe. my mom always made zucchini bread, which i absolutely love. and i imagine adding chocolate only makes it that much better. thanks for sharing. I really love this recipe and just made it again this morning. However, there is an error in the measurement for sugar in this posted recipe. I have a copy of the original (as it appeared in Cooking Light Magazine) and the sugar should be 3/4 cup not 1/4 cup. Perhaps it might be fine with the 1/4 cup of sugar if you are looking to cut back on calories, but I've only ever made it with 3/4 cup. I also use mini chocolate chips rather than the normal size which makes it nice. Jennifer: Eeeeek! That was a HUGE mistake! Thanks so much for pointing it out. I'm not sure if anyone has ever tried this recipe from my blog but if they did, they probably haven't been back ;-)I also added the note about mini chocolate chips! Thanks again! Not sure with what to do with my leftover zucchini, I searched the Internet for ideas, which is how I stumbled upon your blog. The title "Zucchini and Chocolate?" immediately had me intrigued, so I decided to give it a shot... and I gotta say, the results are yummy!My lust for chocolate was totally satisfied with the one serving-size slice that I just ate (which was warm and moist, fresh from the oven!). :) I think this quick chocoholic satisfaction was due to the interestingly complex flavors of the zucchini/ chocolate/ cinnamon trio, for it seemed to be enough excitement for my taste buds. Thanks for sharing this recipe!